Ulfberth War-Bear is a Nord blacksmith living in Whiterun where he runs the armory Warmaiden's with his wife, Adrianne Avenicci. He handles sales of their interior stock while Adrianne does all the work creating it. The armory is open every day between 8am and 8pm when Ulfberth can be found behind the counter, offering his services. After closing up, he heads up to The Bannered Mare where he stays until he heads back to Warmaiden's for eight hours of sleep. The only exception to this routine occurs at the conclusion of the Companions quest Blood's Honor, when Ulfberth will be in the crowd gathered in front of Jorrvaskr after the Silver Hand attack. Ulfberth wears a set of iron armor along with matching gauntlets and boots. He carries his key to the store, a key to Ulfberth's house, a belted tunic, and a selection of common items and gold. In combat, he relies on a steel warhammer. If you meet him in the store, he will greet you with: "Welcome to Warmaiden's. Now don't let the name worry you - we got plenty o' steel for fightin' men." If you are female, he will instead welcome you with: "Welcome to Warmaiden's. Now you, my girl, have definitely come to the right place." He will also greet you with: "We've got small weapons as well as big. Maces, daggers, that sort of thing. ", "You look like maybe you need a new weapon. Something big, perhaps? An axe maybe? Or a greatsword?" or "Crush, clobber, slash or slice. We've got a weapon for any occasion." He will also show great pride in his wife's smithing skills: "Most of our weapons were crafted by Adrianne Avenicci. My woman's an artist, is what she is." When bartering, he will say: "Hmm... Blades, helmets. Pretty much anything to suit your needs." He always ends the conversation with: "Good doin' business with ya." or "We'll have to have a pint together sometime, you and me." If you ask him who forges his arms and armor, he will reply: "Adrianne. At her forge, just outside. Place is named after her. 'Warmaiden's.' It's a childhood nickname, given by her father. What I hear, she was playing with swords even back then. Anyway, our wares are strong and the prices fair. What else matters?" 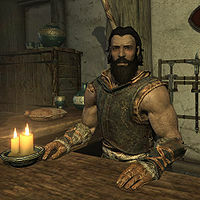 If Adrianne is dead when you ask this, he will reply: "Since Adrianne's death, I've had to buy them from the Khajiit caravans. Tried making some myself, but I'm no good with the forge and anvil. Anyway, our wares are strong and the prices fair. What else matters?" You can also ask him who is in charge of Whiterun. If Balgruuf the Greater is jarl, he will respond: "That'll be the Jarl, Balgruuf the Greater. He's an honorable enough man. Never done wrong by me or my kin. Things are tough for him now, I'd wager. What with the fighting, and the dragons. But Balgruuf's a tough old Nord. He can handle it." However, if the Stormcloaks conquered Whiterun and put Vignar Gray-Mane in charge, he will respond: "Vignar the Revered is the Jarl in Whiterun. I guess he was a great hero once, because the Companions all call him 'Vignar the Revered.' Is Vignar too old to be Jarl? It's a fair question. If he's grown infirm and is losing his wits, where does that leave the people of Whiterun?" At some point during development, Balgruuf's brother Hrongar could be appointed Jarl of Whiterun, and some corresponding dialogue was recorded for Ulfberth: "Hrongar became the Jarl when his brother Balgruuf, who had the job before him, was murdered. Balgruuf was an even-tempered man, but his brother's a hot-blooded war-monger who wants to settle everything with a blade. If you've got some business with Hrongar, mind you stay on his good side. The palace dungeon's filled with folk who roused his temper." "We've got arms and armor of all kinds." "You look like someone who knows how to wield a weapon. Well, you've come to the right place." "If it's armor you need, we've got all kinds, both light and heavy." "Everything you see here was made with skill and care by my wife Adrianne." Ulfberth may spawn and become stuck on a hill near Breezehome in Whiterun and will not open his shop for business. You can sprint into him to push him from the spot on the hill, or use Unrelenting Force to knock him off. Use the tc console command to move him away from this spot. It is possible to invest in Ulfberth multiple times, giving him an exorbitant amount of gold with which to buy. Although Ulfberth will appear to have a high gold amount after re-investing with him several times, if you invest with his wife Adrianne his extra gold will disappear. When the shop resets his extra gold investment will disappear. This page was last modified on 22 December 2014, at 03:30.